Tonkin snub-nosed monkey is a characteristically unusual, distinctive, and one of the critically endangered species of primates in the world. It is one of the five species of snub-nosed monkeys popular for their flat, upturned nose and thick lips. The species is endemic to Vietnam where it is a global priority for conservation. It is estimated that only 200 Tonkin snub-nosed monkeys are left in the wild today and the species was presumed extinct for a while only to be rediscovered in 1989. It is currently the largest primate species in Vietnam. Tonkin snub-nosed monkey has a broad flattened face, with a distinctively pink nose, and tufted ear, giving an almost comical appearance. Both sexes have slender bodies when compared to other monkeys. The coat color and pattern varies among the population. However, the most common markings are black fur on the parts of the body visible on the exterior, while the interior areas are creamy-white. Males have more pronounced orange coloration around the throat and a darker mouth compared to the female. The juveniles have gray fur which darkens to black with age. Tonkin snub-nosed monkey feeds on a wide range of leaves as well as seeds and fruit. It is not strictly folivorous but typically feeds on over 60 species of plants and fruits. The diet is made up of 28% leaf stems, 28% ripe fruits, 22% unripe fruits, 11% immature leaves, 8% flowers, and 3% seeds. It has a succulent stomach with the digestive system specially adapted for digestion of leaves. The strong jaw is related to the dietary preference for tough plant food. The Tonkin snub-nosed monkeys inhabit the subtropical areas of Vietnam, usually at an elevation of between 700 and 3,900 feet above the sea level. The areas are typically associated with mountaineous landscapes. It is largely restricted to the primary evergreen forest. Massive deforestation and hunting have significantly reduced the range and habitat of the Tonkin snub-nosed monkey to just five locations. 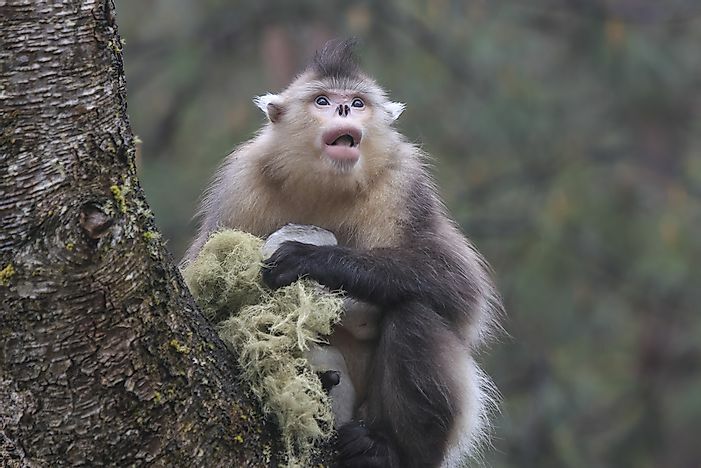 The population of Tonkin snub-nosed monkey has been confirmed to be scattered across several provinces in Vietnam including Hang Giang, Tuyen Quang, and Bac Kan. They can also be found in Thai Nguyen Province although the number might be less than ten. Hunting is considered a major threat to the species. Tonkin snub-nosed monkey is mainly active during the day. It is exclusively arboreal, usually moving across the canopy forest by walking on all the four limbs climbing, leaping, or even suspending on the branches. It moves about the canopy in small groups of about ten to fifteen monkeys with each group comprising of one adult male, a number of females, and young ones. Extra males form an all-bachelor group. The groups do not flee from hunters making them an easy target. It can also carry out some activities such as picking fruits and other foods on the ground. Tonkin snub-nosed monkey sleeps on lower branches of trees on the mountainside to protect itself from cold. There is no evidence of it being able to swim. They have different calls such as a loud hiccough-like alarm call. What Are The Longest Animals In The World?